One way the Mackinac Center can advance its message of “improving the quality of life for all Michigan citizens by promoting sound solutions to state and local policy questions” is by taking part in discussions with other policy-focused groups. We had that opportunity at the recent American Legislative Exchange Council (ALEC) Spring Task Force meeting in Grand Rapids, which was held April 27. Mackinac’s Environmental Policy Initiative was invited to speak at the Energy, Environment, and Agriculture Task Force Luncheon as part of a panel that discussed electricity choice. The luncheon was sponsored by the Conservative Energy Network and featured three other panelists. Michigan House Rep. John Reilly, R-Oakland Township, served as the panel’s moderator. He spoke on the importance of electricity choice to the state’s public schools and his bill (HB 4708) that would allow all K-12 schools in the state to purchase electricity from any provider they choose. Adrian Moore, The Reason Foundation’s vice president of policy, described his organization’s push to educate the American public about the ways that electricity choice improves system reliability, reduces costs and expands generation options. 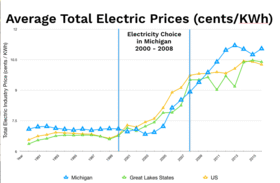 Mackinac was asked to speak on the topic of electricity choice in Michigan. We covered the legislative history of electricity choice in the state, the economic impact of the 2008 re-regulation of choice, our proposals to expand choice and free the state’s electricity markets. While time was limited for the presentation, it was still possible to explain how, in 2000, Michigan deregulated its electricity markets and legally enfranchised residents with the right to choose their electricity provider. Back then, we could do so in much the same way we currently choose our cellular, internet or cable/satellite TV provider. But, in 2008, the Michigan Legislature walked that decision back by reinstating the Michigan Public Service Commission’s oversight over monopoly utility pricing and re-regulating the state’s electricity markets. Their decision severely restricted electricity choice by guaranteeing 90 percent of retail electricity markets to a small group of monopoly utilities. 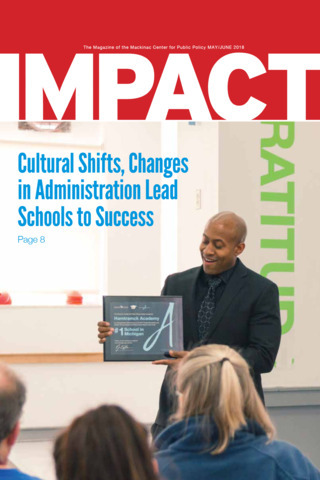 Only 10 percent of retail markets were allowed to remain in the choice market, and that market was almost immediately snapped up by public schools and industrial demand, meaning that no residential customers in Michigan actually have choice. That lack of choice continues to plague our markets today because the Legislature has frequently opted to defer action. For example, in December 2016, Michigan passed Public Acts 341 and 342, which updated state electricity laws. A key argument behind the passage of these bills was that they were needed to maintain an affordable and reliable electrical grid in the state. Michigan’s limited electricity choice market was, at least momentarily, protected in Michigan after a great deal of effort on the part of electricity choice’s defenders. 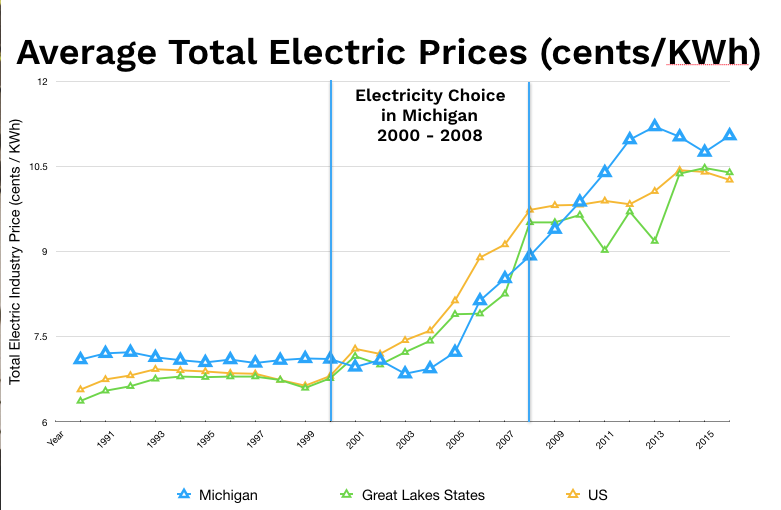 But, as the graph of average total electric prices shows, Michigan’s electricity rates, whether residential, commercial or industrial, are consistently higher than rates in either adjacent Great Lakes states, or across the nation. When we had electricity choice from 2000 to 2008, however, our rates were largely below those seen in Great Lakes states, or across the nation. It’s not surprising therefore, that Bolger’s survey data shows 70 percent of voters would vote to cut regulations and disband legal energy monopolies if they were given the opportunity. Even official state reports say that as many as 28 percent of Michigan residents and businesses would opt for the improved customer service, better reliability and lower prices of the choice market if they could. One of the challenges electricity choice advocates face is a lack of public knowledge about choice as an option. When choice was expanding in telephone and cable TV services, some were unaware that they could choose other options and some were unsure that another option would work well for them. They might not always be happy with their monopoly providers, but they were familiar with the services those companies provided. When they learned they could have access to a better, more reliable service, as well as rapidly improving technologies, the majority of people gladly chose to move away from monopoly providers to a more free-market option. Electricity choice exists in the same sort of space. It would work far better if the legislative cap on choice was removed and energy producers were allowed to compete with each other on a transparent, level playing field. It’s our job to get the truth about electricity choice out to the public, media and elected officials. With your help, we will continue our work to explain the value of free markets and expanded options to electricity customers across the nation.